New York, Feb 1 (IANS): Researchers have used non-science engineering data from NASA's Curiosity rover to find Mars rocks less compacted and more porous than expected, according to researchers. "However, the bulk density that came out of our study is a lot less, 1,680 kg per cubic metre." The much lower figure shows that the rocks have a reduced density most likely resulting from the rocks being more porous, according to the research published in the journal Science. 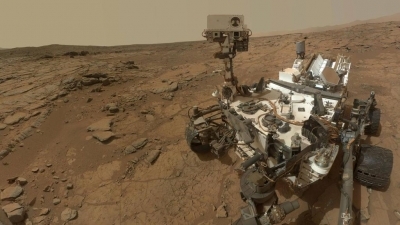 Curiosity landed near Mount Sharp in the Gale Crater on Mars in August 2012, and reached the base of the mountain in 2014.